While One Cool Earth usually has acres to work with, in 2009 Bodhi Path offered their postage-stamp lawn behind a picket fence. 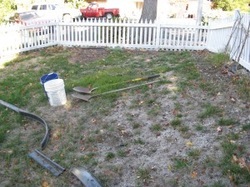 Motivated to remove the lawn to conserve water and provide habitat, the project moved forward. Several species of plants were purchased from the nearby Growing Grounds Nursery, including: yarrow, fescue, purple sage, California fuchsia, California sage, flannel bush, buckwheat, and more. Stones existing on the site were moved to create rock piles and a short retaining wall. In the end, everything was heavily mulched.